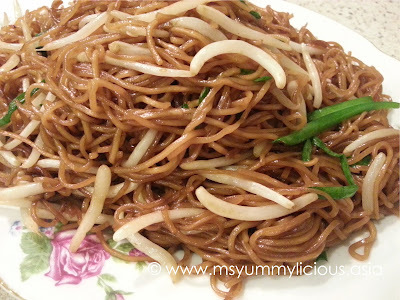 Supreme Soy Sauce Chow Mein is a popular dish in Hong Kong. Usually it is eaten alongside with porridge during breakfasts. This dish is both mine and my hubby's favorite. One thing I like about being a home chef is that I can cook my families' favorite dishes anytime I/they wanted. This simple-looking dish has two main ingredients - Good egg noodles and A good soy sauce. However this simple-looking dish is not as simple as it looks. It has to go though deep-fry, blanch, cold shock and stir-fry to get to this glorious-licious stage. 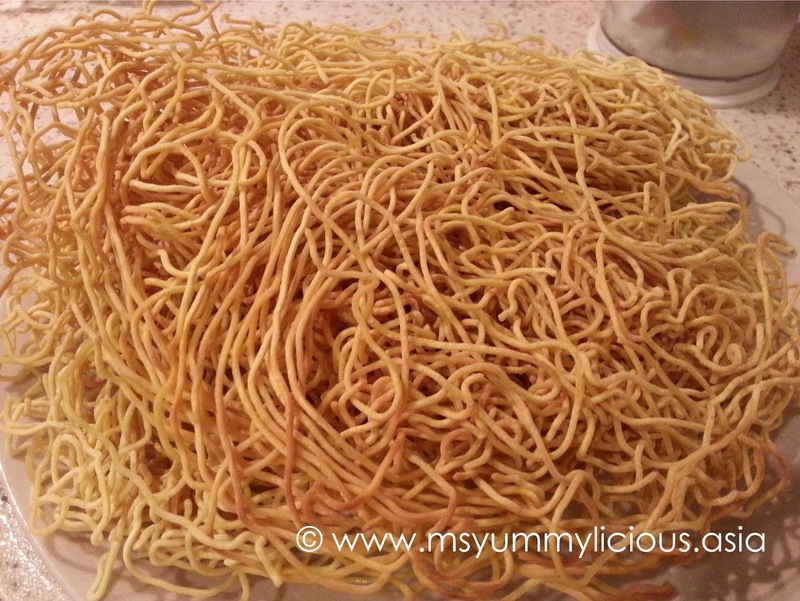 If you can, try to get the egg noodles from your nearest trusted wantan mee vendor or other food vendor who is using egg noodle. If you are close to them (enough), they will sell just the egg noodles to you. Nothing beats the freshness of these egg noodles! After loosen the egg noodles, deep fried them in hot oil for approx. 10 - 15 seconds per side. 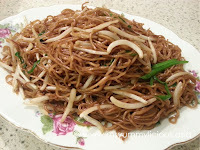 You will get crunchy golden brown fried egg noodles. These are good now if you wanted to make Sang Mee in Egg Gravy. Next, blanched the deep fried egg noddles in boiling water until almost al dente and bring them to cold shock immediately to stop the cooking process. Now you will have almost al dente egg noodles ready for stir-fry. As other stir-fry require, prepare all your ingredients within your reach first before you cook. Everything will happen so fast during stir-frying, you won't have the time to blink your eyes. This Supreme Soy Sauce Chow Mein is really good. You will definitely need a cast-iron wok for this and stir-fry them on high heat. The noodles are super fragrant with the soy sauce and has a good al dente texture. The wetness and dryness of the noodles are well balanced. The only thing that was lacking was the "wok hei/ wok breath" which can be achieved if I had waited for the wok to get smoking hot first before stir-fry. Blame it on my eagerness to get the noodles done! Ok, lesson learnt! But still, the noodles are great. My hubby rated it at 8/10. 1. 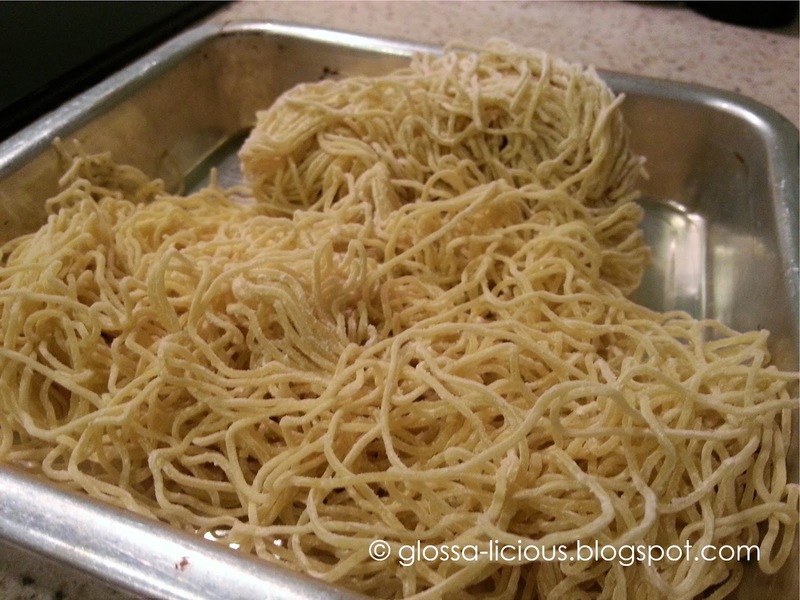 Loosen the fresh egg noodles per bundle and arrange them in a plate. Do not mix two bundles together as we are going to deep fried in two batches. 2. Fill half of the wok with oil and heat it over high heat. 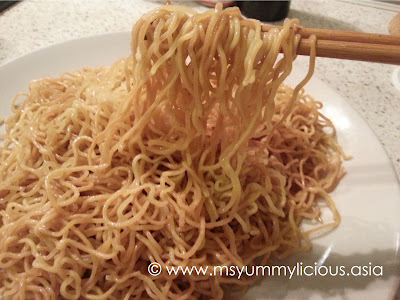 Once the oil is heated thoroughly, place a loose bundle of egg noodle in the center and loosen it up with chopsticks. Deep-fry until golden brown on both sides. Drain and set aside. 3. In the same wok, empty the oil and bring enough water to a boil. Blanch the noodles in the boiling water until almost al dente. Bear in mind that the noodles will go through stir-fry later, so don't overcook the noodles. Immediately scoop out the noodles with a sieve/ colander and submerge them in cold water for a few seconds. Drain and set aside. 4. Heat 2 tablespoon of oil in a wok over high heat. Wait until the wok get smoking hot. Put in the egg noodles and stir-fry for a few seconds. Add in the seasoning and stir-fry to coat the noodles evenly. Add in the bean sprouts and chives, and continue to stir-fry until it reaches the desired dryness. ● To test whether the oil is hot enough, you may do so with a wooden chopstick or a strand of egg noodle. If they bubbles up, then the oil is hot enough. 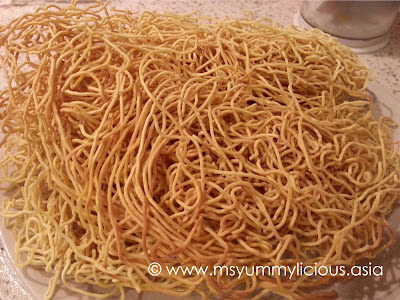 ● To blanch the deep fried noodles, you will need a large surface like in a wok so that the noodles will not break into small strands. Last two weekends ago saw my family and my friends making rounds around SS15, Subang. It was the craziest night. In just one night, we visited a cafe, two ice-cream shops and a bubble tea shop. We started off by having dinner at Flingstones Cafe to celebrate my good friend's (aka bro-in-law 'K') belated birthday. 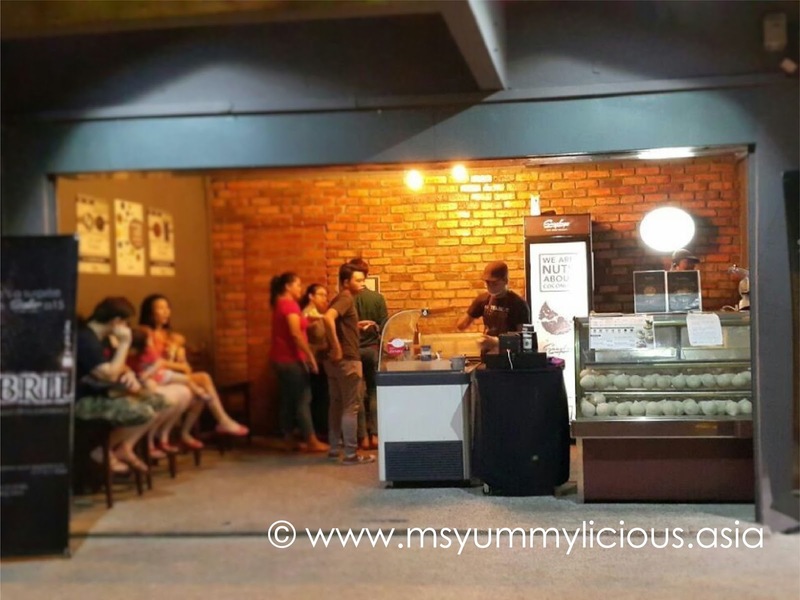 Then we went for ice-cream and waffle dessert at Fatbaby. 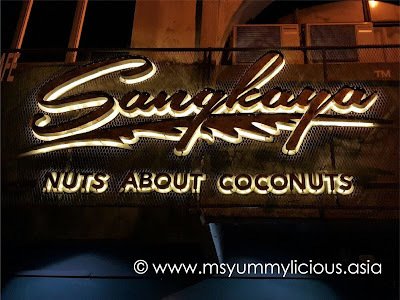 Still not enough, we walked down the street for more ice-cream at Sangkaya. Lastly, we settled down at Gong Cha for a quiet chit-chat. Crazy but it was a great catch-up with my friends, as well as a good opportunity to try out the new stuffs in town! 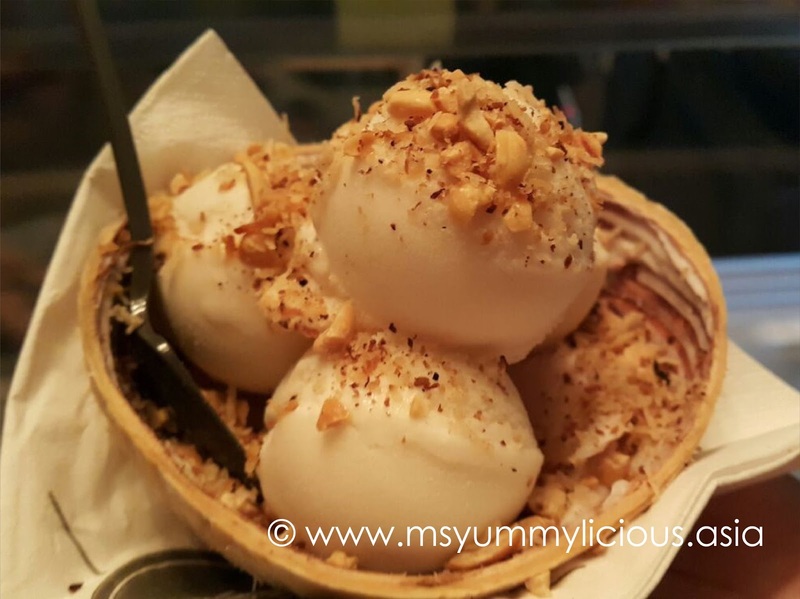 Sangkaya is an ice-cream parlour offering anything coconuty, from ice-cream to drinks. According to their website, there is also a Thai Milk Tea ice-cream but I don't think I have seen it on that night. Maybe I was too engrossed with their Signature ice-cream. The hefty price tag doesn't seems to bother too. I don't mind paying a little extra for beautifully presented goodness (but only once or twice, or maybe thrice on the same item). This is their top recommendation - 4 scoops of premium coconut ice-cream with 3 toppings of your choice, served on fresh coconut husk, with coconut flesh strips. (If I remember correctly), there were around 5 toppings - toasted peanuts, toasted desiccated coconut, corns, chocolate syrup and cornflakes. The ice-cream were indeed premuim - rich in flavor and has a very nice creamy texture. But unfortunately, the toasted peanuts (on that day) were not fresh. It has a "Yik" smell, like expired peanuts. You may choose to sit outside at the alfresco area or inside Jibril Lounge, which is just behind this 'brick wall'. The door seems to be hidden, it is actually on the left hand side of this 'brick wall'. Just push yourself in to enjoy a totally different environment. 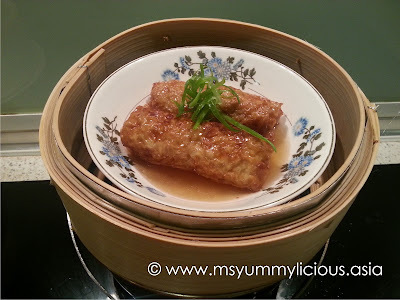 May it be for breakfast or supper, my hubby and I love eating dim sum. We used to go dim sum with our good buddiess at Jalan Ipoh, KL almost every weekend night. We would chit chat until late at night and still be getting freshly steamed dim sum. It was our favorite hangout place. 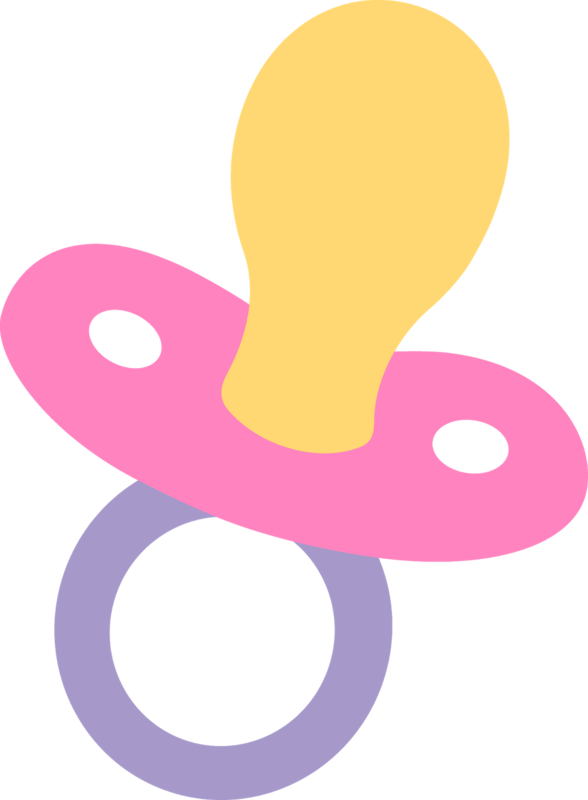 But ever since giving birth to our little Prince Miguel, we hardly go out at night. Nowadays, we would preferred to bring the foods to us at the comfort of our own home, where the family can enjoy homecooked foods. I've been wanting to made dim sum (any kind) for quite some time but just didn't get the chance. 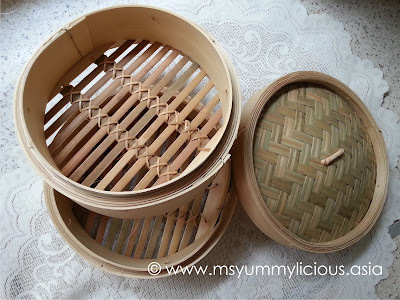 Since my hubby has just bought a nice two layers bamboo steamer, I thought, "Yeah, now is the time!" The ingredients are very straightforward, you can easily get them at last minute. If you can't get water chestnut in market, try those peeled ones at fruit stalls. These beancurd rolls or more known as "Fu Chuk Guen" is one of my hubby's favourite. But not all dim sum restaurants have this dish in their menu. My hubby is very happy now that his Wifey can made this at home. He rated this at 8 out of 10. He said it needed more layers. 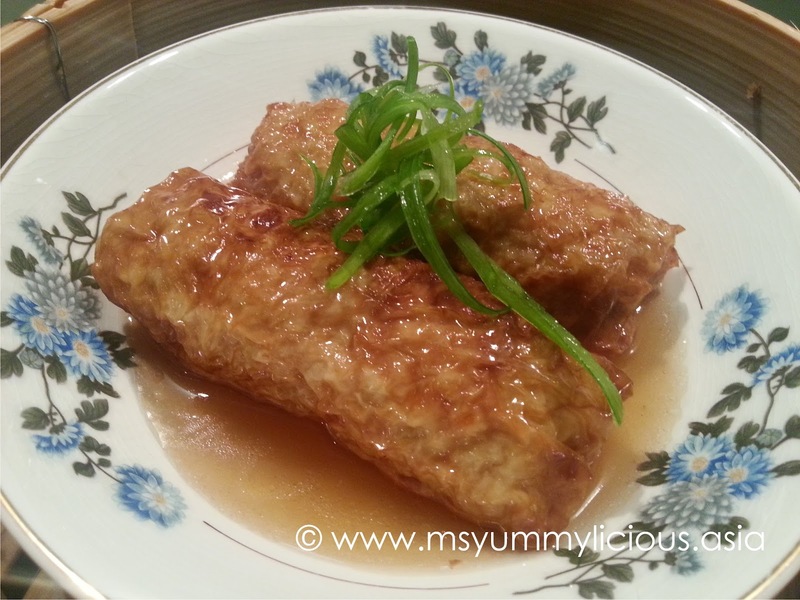 So in the recipe below, I've adjusted the length of the beancurd skin. 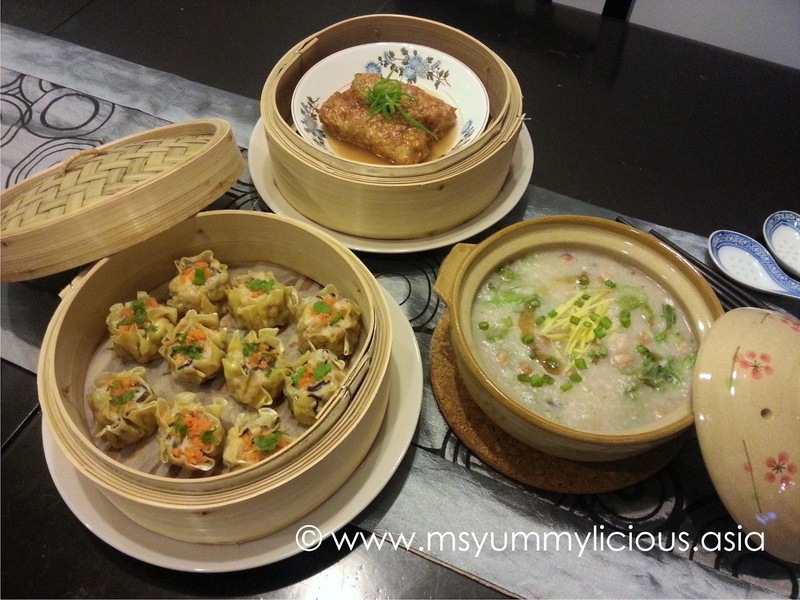 Together with some Siu Mai and porridge, you can have a simple dim sum dinner at home. Best of all, it's homecooked foods made with love! 1. In a large mixing bowl, combined all ingredients and seasoning. Mix well and marinate for at least 3 hours. 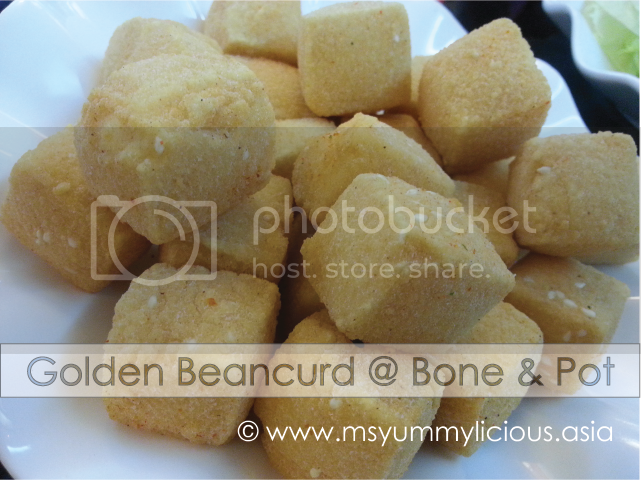 [Photo Inset: Left] Wipe beancurd skin gently with a damp cloth to soften it. [Photo Inset: Right] Place the filling approx. 1/4 from the top of the wrapper, size of filling approx. 3.5" x 1" Ø. [Photo Inset: Left] Fold the top towards the center, covering the filling. [Photo Inset: Right] Follow by the sides. 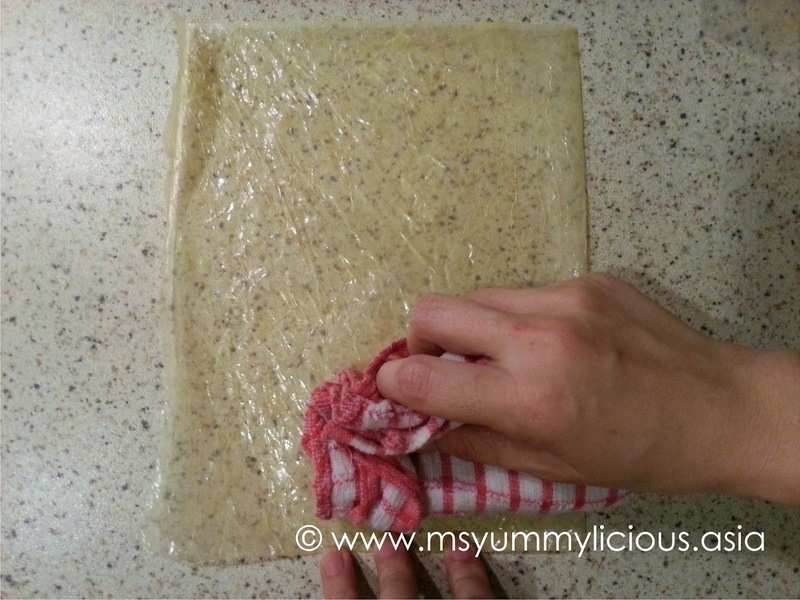 Tuck the filling neatly and tightly as you roll the beancurd roll upwards. Seal with a little egg yolk at the edge to secure it. Repeat until all the filling has been used. You should be able to make approx. 13 rolls. 3. 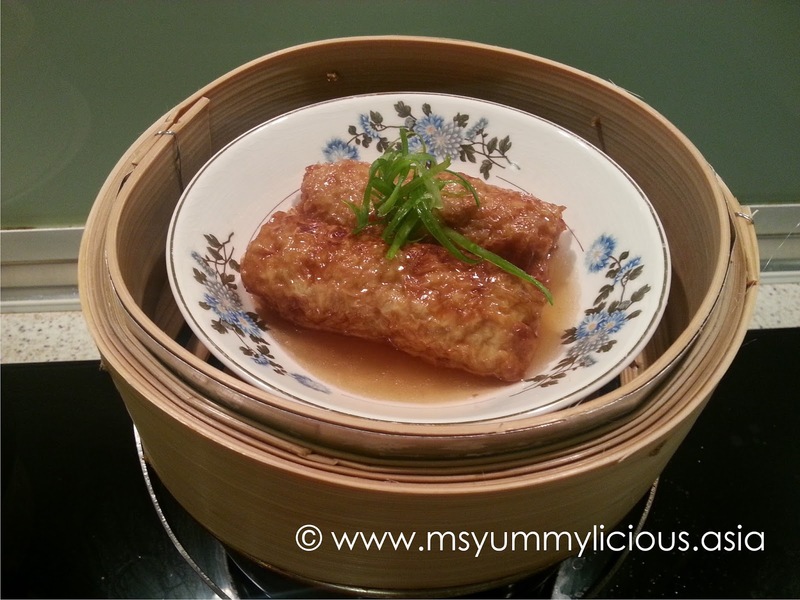 In a pan or wok, shallow fry the beancurd rolls until golden brown on both sides. You do not need to cook them thoroughly at this stage. Drain on paper towel and arrange neatly on steaming plate/s. 4. Made the sauce: In a pan or wok, saute ginger and garlic until fragrant. Add in chicken stock, white pepper and oyster sauce, bring to a boil. Add in shaoxing wine and thicken with corn flour mixture. 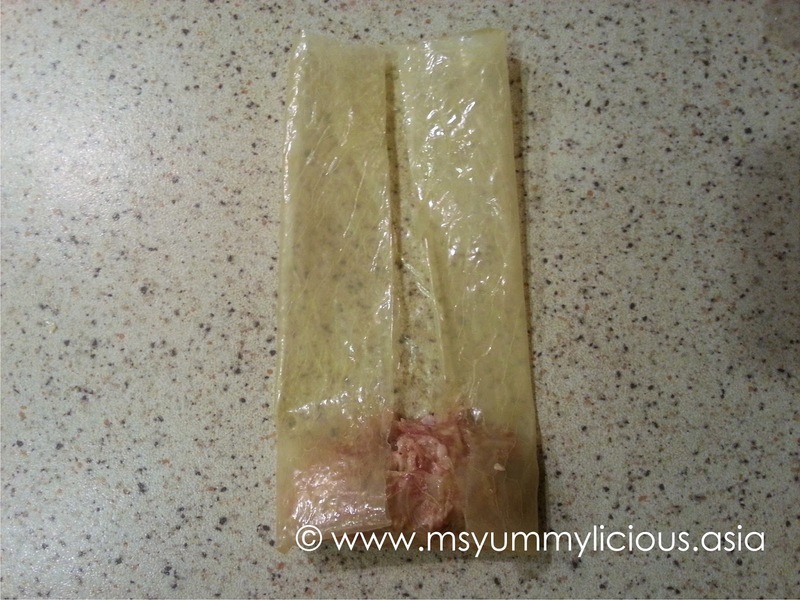 Strain the sauce onto the beancurd rolls. 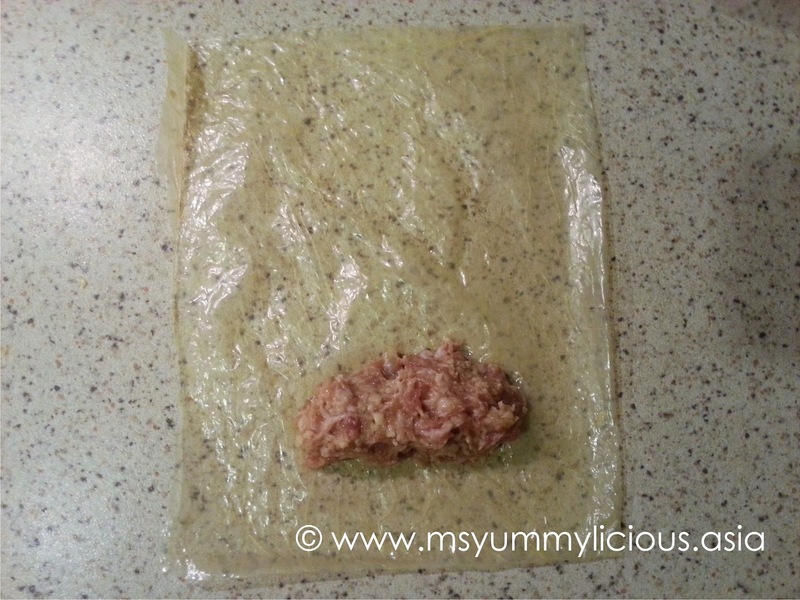 Discard the minced ginger and garlic. 5. Steam for 10 mins or until cooked. Garnish with spring onions and serve immediately. ● To get instant chicken stock, add 1 tsp chicken granules to a cup of lukewarm water. 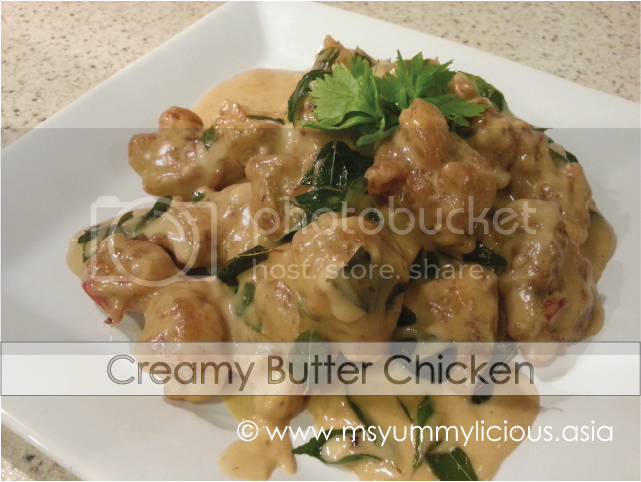 I've tweaked her recipe a little to suit my hubby's palate. My hubby wanted roast chicken instead of the usual white color herbal chicken, so I baked the chicken (uncovered) first, then only add the herbs to it and baked again. The meat was so juicy, moist, tasty and soft, so soft that you can just tear it off with your fingers. And with the flavorful gravy, ones can easily finished 2 bowls of rice with this dish! Simply yummylicious! 1. Rub salt and oyster sauce on chicken and marinate for at least half an hour. 2. Baked the chicken at 200°C for 20 mins on each side, until golden brown. 3. In a small pot, add 1 1/2 cup water and all the herbs except Tong Kuai and Chuin Kung. Bring to boil and let simmer for approx. 5 mins. Add oyster sauce and salt to taste. Remove from heat. 4. Slightly mold 2 big sheets of aluminum foil on a big round tray/ bowl, followed by a baking paper. Then place the chicken in the center and put the dried herbs: Tong Kuai and Chuin Kong at both, front & back of chicken. Then pour in the herbs water onto the chicken, submerging the chicken at least 3/4 of the chicken. 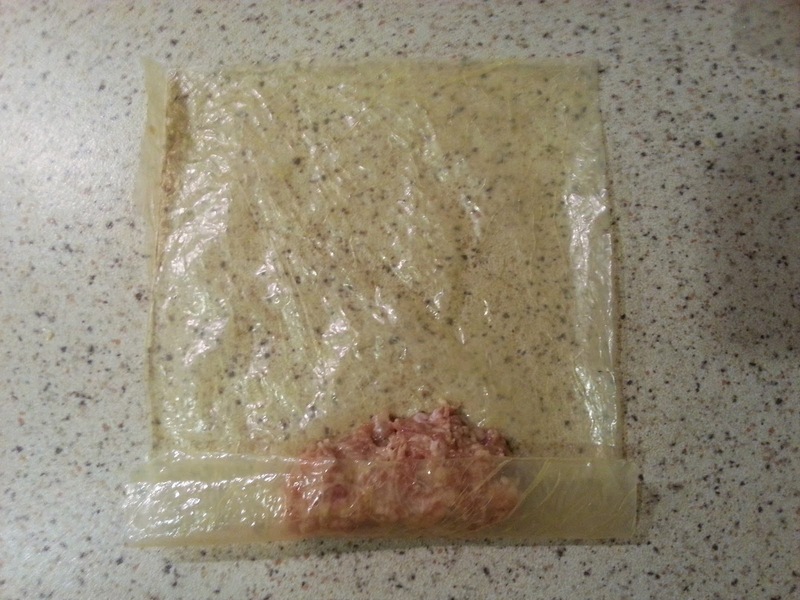 Quickly wrap the chicken nicely, be careful not to spill the herbs water. 5. Bake in oven for another 20 mins at 200°C. Enjoy hot! ● Use a deep bowl or round tray to help with the wrapping. ● If the wrapping is not tucked nicely, there might be spillage or leakage. Always bake with a tray or bake in a bowl to avoid untoward disaster. ● If using whole chicken, you may double the recipe. 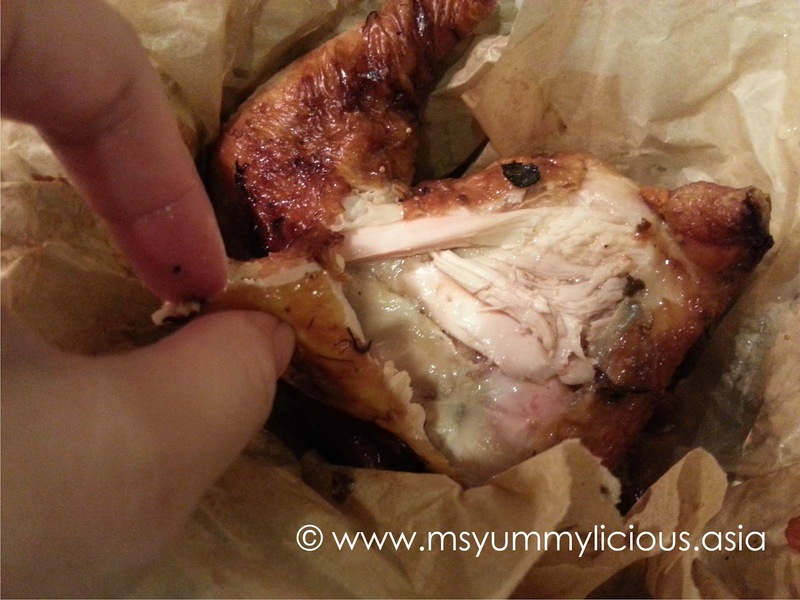 Rub salt and oyster sauce all around the chicken including under the skin and inside the stomach. 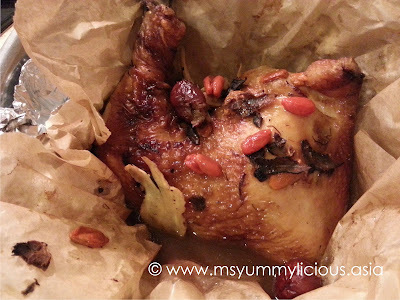 ● You may omit Step 2 if you do not want to roast the chicken. Just add more time to the last baking. 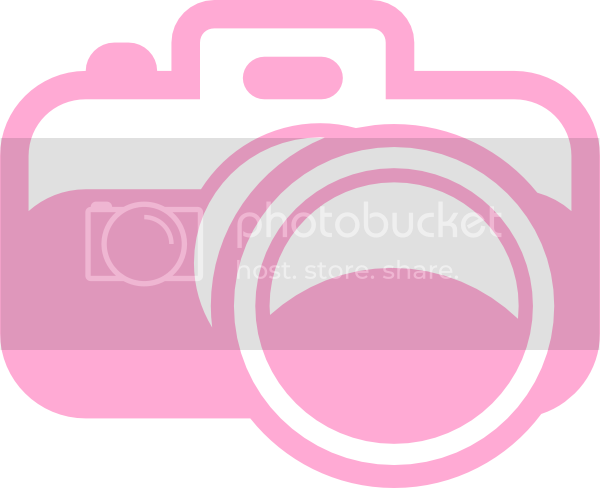 I am linking this post to Bake-Along event hosted by Joyce, Lena and Zoe for Bake-Along #93. Sai Mai Lo or Sago Soup is a famous dessert originated from Hong Kong. It is made with sago/ tapioca pearls, coconut milk and evaporated milk. Other ingredients can be added such as honeydew, mango, taro or watermelon. Usually it is eaten cold, altho' some peoples will prefer it hot. Actually I hesitated to post this recipe online because the dessert looks very pale with the whitish fruit instead of looking refreshing green. This is because the honeydew that I've bought was white (hence the whitish looking dessert) and not sweet. But good thing that the fragrant of the honeydew was still there. Other than looking pale, the dessert tasted great! So, since it is so hot nowadays, lastly I've decided to post this recipe. Hope you all will benefit from it! Enjoy my recipe! 1. Cut the honeydew into cubes or your desired size. For another half of the honeydew, make into puree. Store both in refrigerator until needed. 2. In a medium pot, bring water to a boil. Add in sago and cook sago until translucent, approx. 10 minutes. Stir constantly to avoid sago from sticking together. 3. Scoop the cooked sago directly into a big bowl of cold water to stop the cooking process. Stir and rinse thoroughly. Place the sago in a bowl of cold water and chill in refrigerator until needed. 5. Leave to cool before chilling in refrigerator, chill for approx. half an hour. 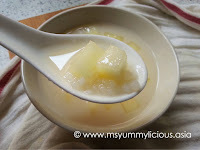 Add in the honeydew cubes, puree and sago pearls in the coconut mixture and continue to chill for at least 3 hours. ● The honeydew that I've got is not sweet, so I added 1 cup of sugar. If you are able to get a good sweet honeydew, reduce the sugar by 1/4 cup and adjust the sweetness accordingly. ● You may also add Glass Jelly/ 'Leung Fun' to the dessert.